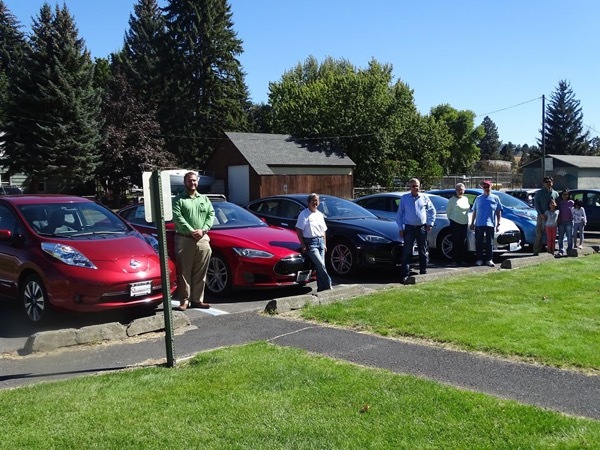 This was our first NDEW in a small town of Palouse, population <1,000, but we got one Tesla owner who drove ~300 miles just for the event! Our local utility, AVISTA, that is installing a number of EVSE in Eastern Washington was our local sponsor of the event. Paul Kimmel, the Business & Public Affairs Representative of the Palouse Region for AVISTA was there to answer questions and give out a door prize. Jamison Voyt, 2013 Nissan Leaf; Charlotte Omoto, 2013 Tesla Model S; Ron Murray, 2015 Tesla Model S; Julie and Erk Ohlund, 2014 Tesla Model S; Ching Guo Wu and family, 2013 Nissal Leaf. Come check-out electric vehicles. We will be at the beautiful Hayton Green Park in Palouse shaded by huge trees. We encourage anyone interested in electric vehicles to register to have an opportunity to test Ride/Drive an electric vehicle. If you are bringing a plug-in vehicle please indicate which model. Before you shop for a new or used car talk to the owners of plug-in vehicles without any pressure from the typical car dealer experience. Bring the whole family! Lunch will be available at the Park provided by Palouse Caboose.